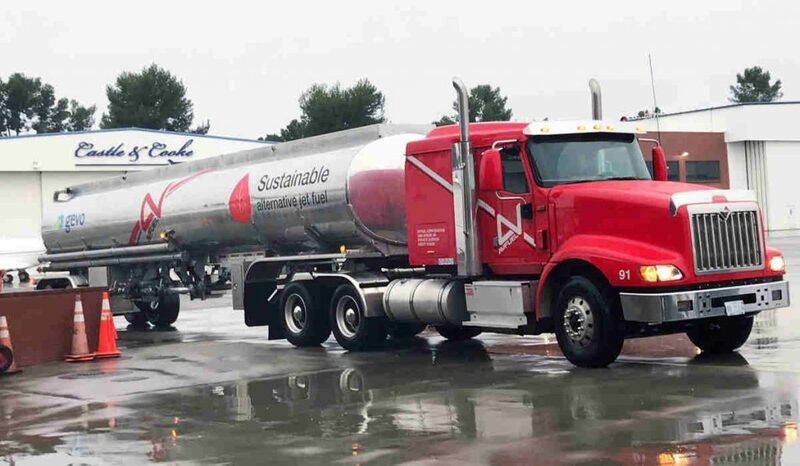 Avfuel supplied its first full truckload delivery of sustainable alternative jet fuel for an event called Business Jets Fuel Green: A Step Toward Sustainability held at Van Nuys Airport (KVNY), which is situated in the San Fernando Valley on the city limits of Los Angeles, California. Avfuel describes this as a landmark moment amid its ongoing initiatives in the area of sustainable alternative jet fuel (SAJF). As part of the event, operators flying in to Van Nuys’ Castle & Cooke Aviation and Signature Flight Support FBOs were able to purchase Avfuel’s new SAJF product on January 17. Avfuel supplied the day’s SAJF in partnership with biofuels company Gevo Inc., which produces the concentrated SAJF product. Avfuel then blended the concentrated SAJF product with petroleum-based jet fuel and tested the fuel for quality and to ensure it met ASTM D1655 standards. Gevo’s product, explains Avfuel, has a net benefit to the environment across its lifecycle: For every one million gallons of SAJF the company produces, approximately 20 million pounds of animal feed and protein is produced and sold into the food chain. Avfuel entered into an agreement with Gevo in July 2018 to be its exclusive fuel supplier. The full load at the Van Nuys event is described as the first fruits of this partnership. Avfuel explains, to deal with the major challenge of product availability, it has a dedicated alternative fuels team that has been working to procure reliable sources of the product and encourage producers to create more of it through formalized commitments with flight departments.